Very simplistically, myth is the story of a certain people. The study of these beliefs, customs, fables and sacred texts is called mythology. It’s a power that allows people (such as witches and wizards) to do impossible things by chanting special words or performing special actions. So, is myth and magic real or is it simply a metaphor for life? A story-telling tool our ancestors used to explain the human condition to each other? And if it was then what does it mean for us now in the modern world where much of the secrets of our universe can be explained through science. Myth tells us of heroes like Karna and Achilles—both sons of gods who were born or were gifted with the power of indestructibility. Karna was born with a divine golden armor (kavach) that protected him against any weapon, spell and wound until a jealous god—Indra—fooled Karna into slicing the armor off his body and gifting it away. The story of Achilles and his infamously vulnerable heel runs in a similar pattern. In both stories, fate in the form of a god or magic, destroyed the impregnable defenses of the super warriors, killing them. Then there is the magic of the ancients: Moses parting the Red Sea; vimanas (flying vehicles) of the Ramayana and the Mahabharata; spell-infused objects of power; divine weapons or astras. Did all this magic actually happen? It seems unbelievable to our science-tapped minds…and yet, the modern human psyche evolved from these stories. What about now? How have our stories…our myths changed? In the Age of Science, we too have non-magical impregnable defenses for an individual or even a country…until those defenses are shattered by a nuclear bomb, a terrorist attack, some faceless enemy through fear or simply a twist of fate. Now, a soldier wears Kevlar instead of a divine golden armor. Before we had state letters that were intercepted by spies, now we have viruses and hackers bringing down entire corporations from a voice-activated laptop. In short, the ancient people had myths and magic to tell their story and we modern folk have science fiction and fantasy to tell ours. The geek in me couldn’t resist tinkering with this dichotomy. Of clashing the old versus the new; the east vs the west; god vs demon; and the magical and mythical vs the modern. 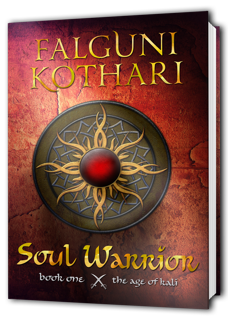 Soul Warrior is an urban fantasy novel based in the cultural myths of India. It’s the first book in the Age of Kali series, and its protagonists are Karna and Draupadi, two central characters from the ancient Indian epic, the Mahabharata, who now exist in a very urban, modern world. So, put on your seatbelts, everyone, and get onboard for the adventure ride that is Soul Warrior (the Age of Kali, #1).